How do you keep an espresso machine among the top sellers for five years straight? The Breville ESP8XL Café Roma has achieved this remarkable accomplishment and, based on scores of satisfied owner reviews, has done it by sticking with the basics and steering clear of gimmicks. For traditionalists who want superior espresso produced by a reliable machine in an aesthetically-pleasing yet solid stainless steel case, the Breville ESP8XL may be the one for you. 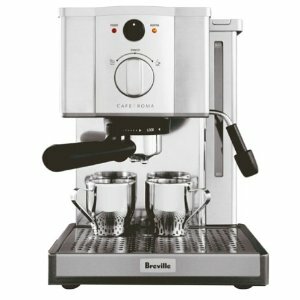 The popular Breville ESP8XL Café Roma earns strong marks in producing crema-rich espresso in a very competitively priced unit. The stainless steel unit is attractive and solidly built. Owner reviews frequently cited the quality and quantity of rich and foamy crema atop the espresso produced by this unit. The dual-wall filter helps produce quality espresso but will require cleaning after a few uses. Owners reported easy cleanup, facilitated by the removable drip tray. While not overloaded with features, the unit has some nice touches, including: An external water window that indicates when the tank is low; a 1.2 liter water tank, larger than most in this class; three stainless steel filters (single shot, 7g; double shot, 14g; and pod). Overall, strong positive feedback for this no-frills semi-automatic that seems poised to remain among the top-selling espresso machines for some time.